Take one bowl and add besan , curd , water , salt , turmeric powder , citric acid , sugar mix well for 2 to 3 minutes. Leave it for 5 minutes. Add fruit salt and bit very well for 3 to 4 minutes . Pour the mixture into silicon cupcake mold . 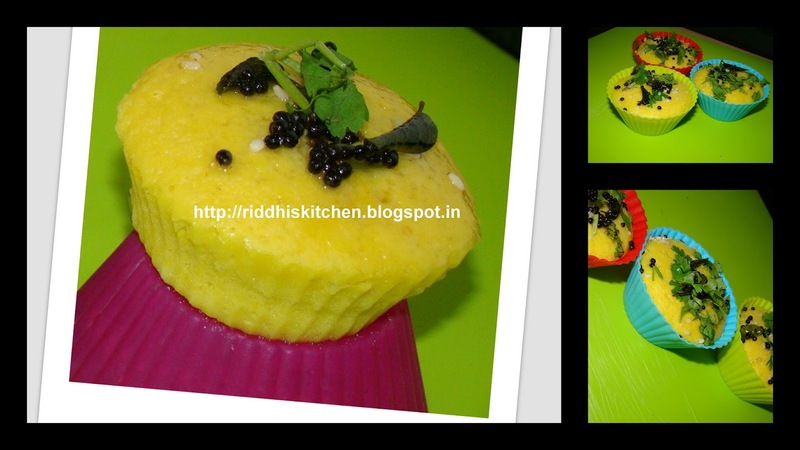 Take micro proof container ,add 1/2 cup water , arrange cupcake mold , set timer for 3 minutes at highest temperature . let it cool outside for2 to 3 minutes. Meanwhile heat oil in pan , add mustard seeds , let them splutter . add green chilli ,curry leaves , sesame seeds , sugar , 1/2 cup water . boil for 1 minute . pour this tempering each cupcake . soak for 3 to 4 minutes . unmold it , garnish with fresh coriander leaves and serve it .